Special Theme: Namibia: the Independence Process. Namibia and International Law: an Overview; G. Abi Saab. The Role of the United Nations Transition Assistance Group (UNTAG) in the Independence Process of Namibia; M. Sinjela. Namibia: the Supervision and Control of the Electoral Process by UNTAG; G. Jituboh. Political Amnesty and Repatriation of Refugees in Namibia; H. Ntchatcho. Towards New Approaches to Treaty-Making in the Field of Environment; A.O. Adede. Réflexions sur la convention des Nations Unies sur le droit de la mer, dix ans après son ouverture à la signature: la question du régime d’exploitation des fonds marins; F. Belhaj. L’Afrique et le droit international de la mer; M. Djiena Wembou. The Treaty Establishing the African Economic Community: an Introductory Essay; J. Senghor. The Bamako Convention on Hazardous Waste: a New Step in the Development of the African International Environmental Law; F. Ouguergouz. Michel-Cyr Djiena Wembou, L’ONU et le développement du droit international (Berger-Levrault international, 1992); M.C. Borloyannis. The International Law of Human Rights in Africa: Basic Documents and Annotated Bibliography; compiled by M. Hamalengwa and others; F. Ouguergouz. OAU: Treaty Establishing the African Economic Community. Bamako Convention on the Ban of the Import into Africa of Hazardous Wastes. OAU: African Charter on the Rights and Welfare of the Chiled. OAU: Declarations and Resolutions Adopted by the Twenty-Ninth Ordinary Session of the Assembly of Heads of State and Government. 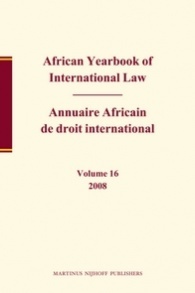 African Association of International Law: Statutes. Index.